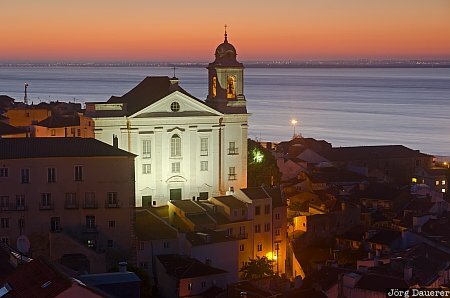 The houses of the Alfama at the blue hour before sunrise with the illuminated church Santo Estevao in the center. Lisbon (Lisboa) is the capital of Portugal. This photo was taken in the early morning of a sunny day in April of 2011. This photo was taken with a digital camera.